Unless you’ve been living under a rock, you’re aware that America is facing a crisis of unprecedented proportions – a crisis which, if left unsolved, will have a negative impact on the US economy and America’s collective morale. The fiscal cliff? 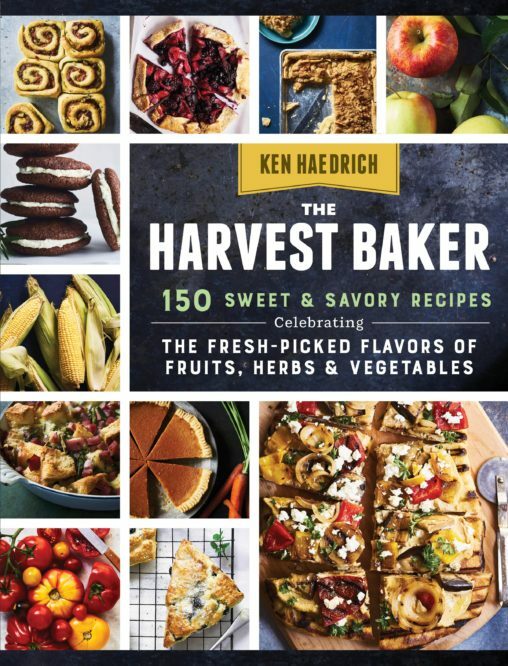 No – it’s what the heck to do with all of those Thanksgiving leftovers! Nothing against leftover turkey sandwiches, mind you, but you can only eat so many of them before their charm starts to fade. You need a dish that everyone loves, one that can take a serious swath out of all your leftovers, not just the bird. 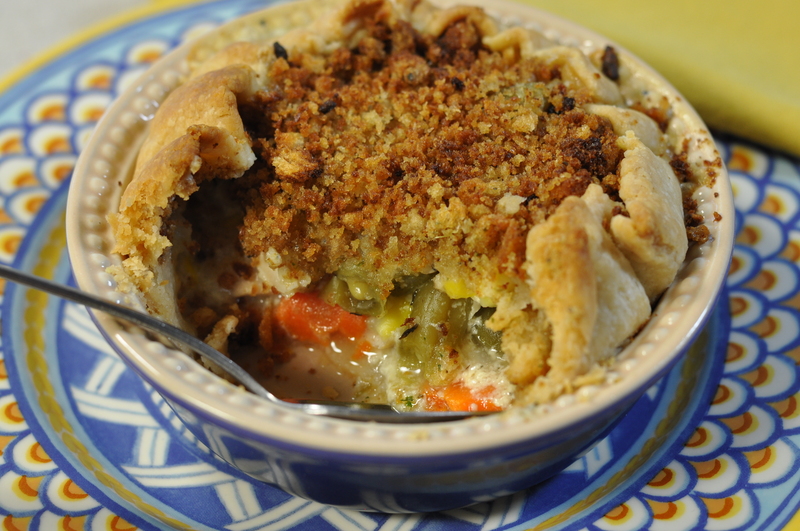 You need Thanksgiving Leftovers Pot Pies, and I have the recipe. 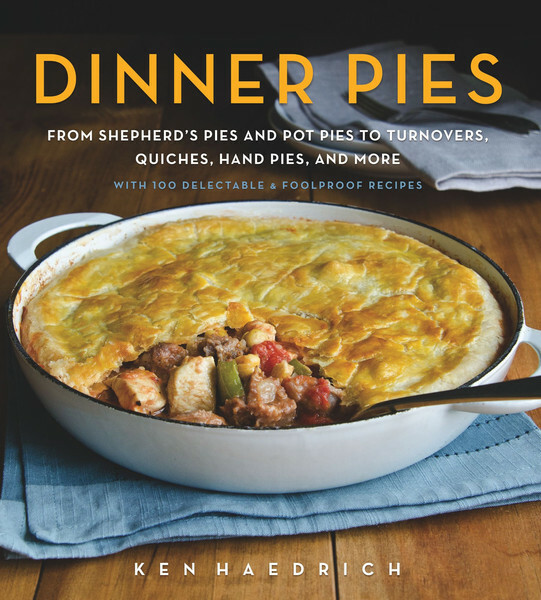 Actually, it’s less of a recipe than it is a blueprint for assembling your pot pies. 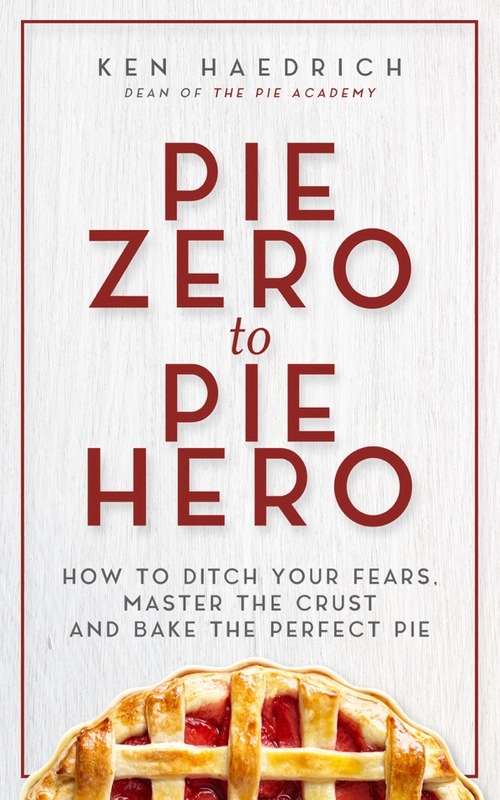 A blueprint is preferable to a prescription when you’re dealing with mounds of leftovers because it leaves you plenty of room to customize your little pies according to need. 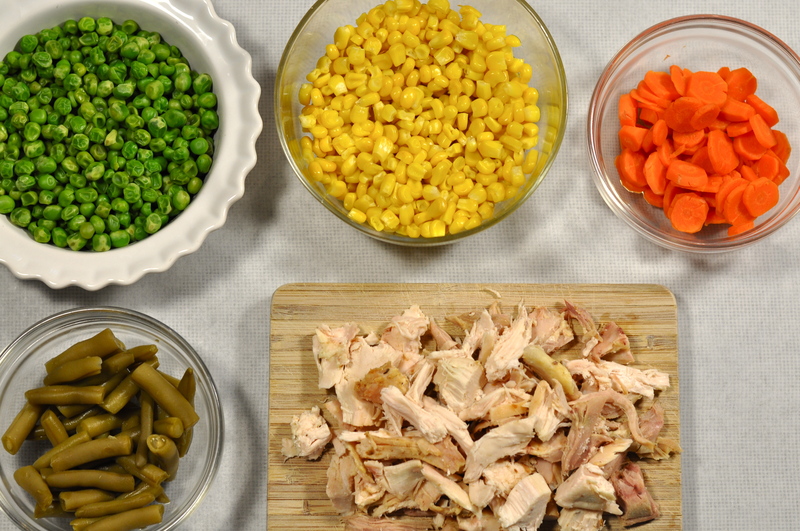 You can go overboard on the turkey; dispatch the green beans; find a home for those last spoonfuls of corn. We begin with the pastry and I will direct you to the GOOD BASIC PIE DOUGH that I love so much. Instead of making one big disk you will divide it into 4 or 5 pieces like you see here. 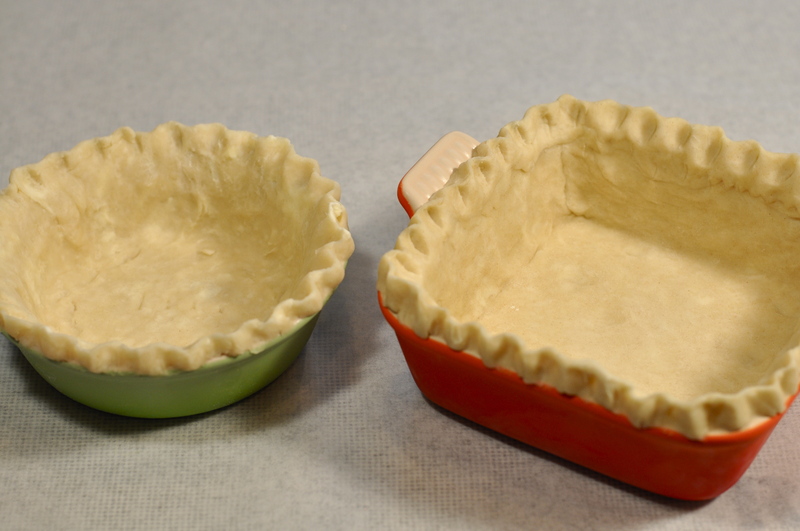 Most of the mini pie pans I have are about 4″ across the opening, and if yours are too, divide it into 4 pieces. You’ll be rolling the dough pretty thin…and making the circles a little larger than you might expect…so it’s better to have a little more dough than you need for each pot pie shell, rather than too little. If you’re feeding more than four people, you should probably just make two batches of the pie dough. After you make and divide the dough, shape the pieces into disks a little less than 1/2″ thick, wrap each one in plastic wrap, then refrigerate for at least an hour. If your dishes are square, shape the dough into squares rather than circles. 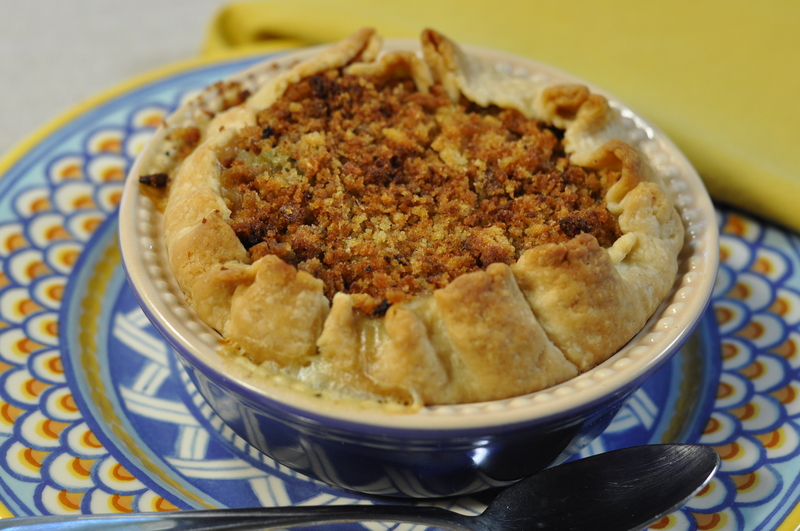 I have several different types of mini pie pans and most – like I said – are about 4″ across the opening. 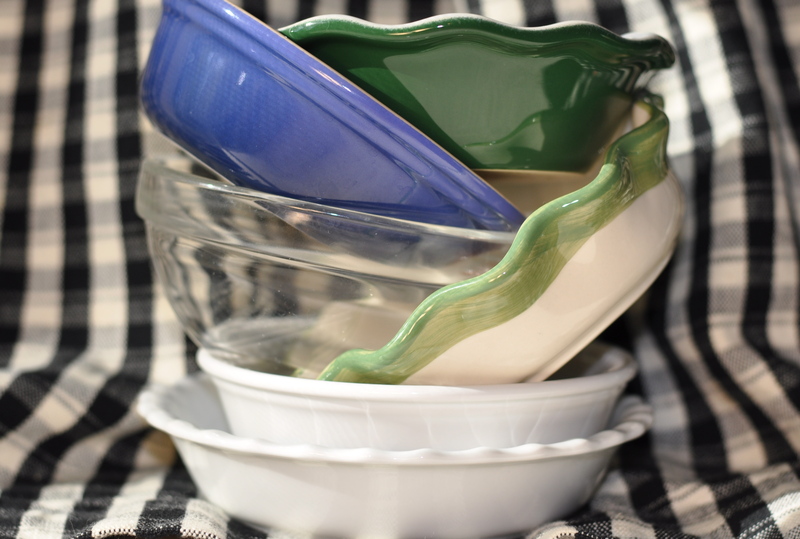 The traditional pie pan shape, with sloping sides, is best. Deep, narrower ramekins will do, but it’s much tricker to get your pastry into a dish with deep, straight sides and line it nicely. I also like square bakers or baking dishes; the one you see here below is great, but it’s really a two-person serving, not an individual one. Even muffin pans will work; if you’re using the standard-size cups, divide the dough into 5 pieces instead of 4. The dough has to be rolled pretty thin and this is one instance where I like rolling between two sheets of plastic wrap. Flour it lightly. Put a disk in the center of a sheet, flour lightly, and cover with another sheet, then roll. If your pan is about 4″ across, you’ll probably need to roll the dough into an 8″ circle. Peel off the top sheet of plastic, turn the dough over onto your outstretched hand, then peel off the other sheet of plastic. Now comes the fun part. 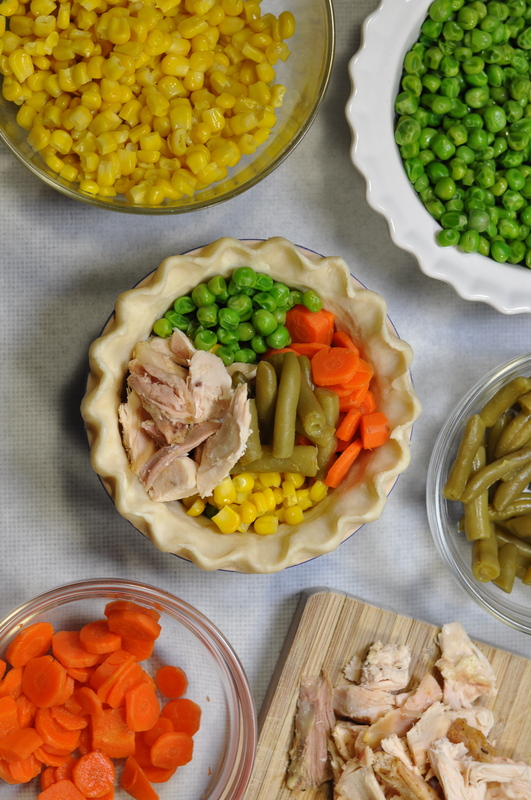 While your pie shells are chilling, get out your leftovers and stage them for assembly. Cut your leftover turkey into bite size pieces. Since they’re probably cold, place the leftovers in individual dishes and microwave them to take off the chill and warm just a tad. This will reduce your overall baking time by a good 15 minutes. Make the Pot Pie Gravy (recipe appears below) and have that standing by. Ditto for the Buttered Stuffing Crumbs (also below), which I like to use here instead of a top pastry. Preheat your oven to 375°. Now comes the fun part – the assembly. 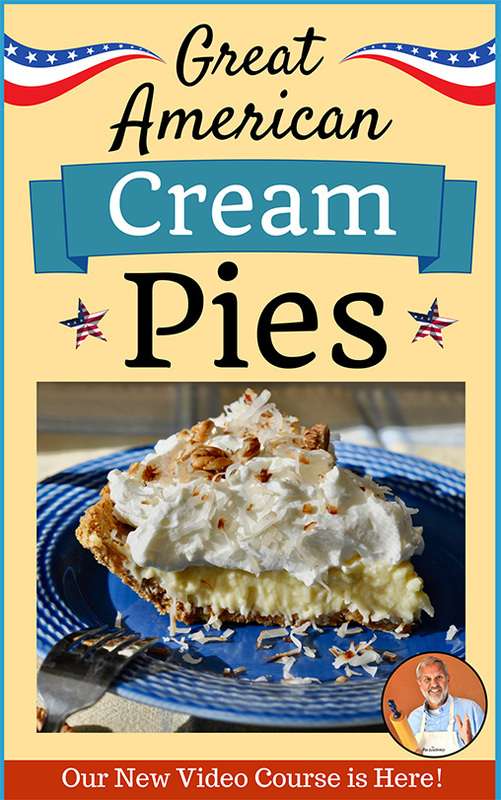 Get out your chilled pie shells and fill them about a third full with your choice of leftovers. Cover with gravy, another third’s worth of leftovers, and more gravy. Don’t skimp on the gravy; pot pie should always be nice and saucy. Scatter a few more leftovers on top. The shells should be about 3/4 to 4/5 full. Put the pot pies on the center oven rack and bake for 25 minutes. Pull out the oven rack and put a good-size pile of buttered crumbs in the center of each one, then spread the crumbs evenly toward the edges with a fork. Reduce the heat to 350° and bake another 15 to 20 minutes, until the crumbs are browned and the sauce – most likely -bubbles. If the sauce happens to bubble up and over, slip a sheet of aluminum foil onto the shelf below to catch drips. And that’s all there is to it. Enjoy those leftovers. And if you want Santa to bring you some of those pretty Le Creuset mini pie pans I use here, my private Le Creuset sale is still going on. TO MAKE THE POT PIE GRAVY, melt the butter in a medium-size saucepan over moderate heat. Stir in the onion and saute gently for 2 minutes. Stir in the flour and continue to cook over moderate heat for 1 minute, stirring nonstop. Stir the chicken stock into the pan; whisk gently over medium heat until the gravy starts to thicken. Stir in the milk, thyme, and pepper. Continue to heat, stirring, for about 4 minutes. The gravy will have some body, but it won't be too thick. Remove from the heat. Taste the gravy and see if it needs a bit of salt. Set aside until needed. TO MAKE THE BUTTERED STUFFING CRUMBS, put the stuffing mix in a heavy duty plastic storage bag and seal. 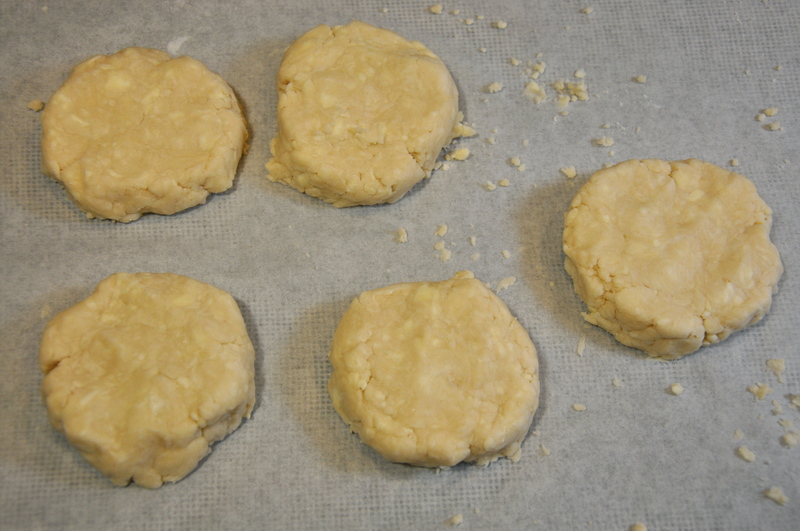 Using a rolling pin, crush the crumbs until they're well broken up but not crushed fine - you want a little texture left. Melt the butter in a medium skillet. Stir in the crumbs. Heat, stirring well for 1 minute over moderate heat, and then remove from the heat. Set aside until needed.